46 National Organizations to Congress: "Stop Obama's Illegal IRS Health Care Power Grab"
Forty-six national organizations, fighting to reverse the government takeover of health care, have signed the following letter, urging Republicans at all levels to stand firm against ObamaCare's health care "exchanges" and to take decisive action to resist the recent IRS power grab that threatens to impose exchanges on all 50 states in violation of law. If you agree we should repeal ObamaCare, SIGN OUR PETITION NOW. On behalf of the millions of members and supporters of our organizations, we are writing to offer our strong support for S. J. Res. 48, your resolution of disapproval of the IRS premium tax credit rule. This rule amounts to an illegitimate backdoor rewrite of the president’s health care law and the imposition of an unauthorized tax on employers of up to $2,000 per worker. We therefore urge all of your colleagues to support S. J. Res. 48. The president’s health care law, the Patient Protection and Affordable Care Act (PPACA), attempted to coerce states into administering its vast new health care entitlement by offering huge subsidies that were contingent on states setting up “exchanges,” new health care bureaucracies. The law’s supporters thought every state would be eager to do it – but many states have chosen not to. Now the IRS is attempting to rewrite the law to force states that lawfully opted out back into the subsidy regime by allowing subsidies to flow through federal exchanges. Yet there is no mention of a “federally-facilitated Exchange” anywhere in 36B. In fact, the definition of the new credit under 36B specifically requires enrollment “through an Exchange established by the State under 1311 of the Patient Protection and Affordable Care Act.” Identical language appears in the definition of a “coverage month” later in 36B. Not only does 36B clearly state that eligibility for the subsidy requires enrollment in an exchange “established by the State,” but it also specifically cites section 1311 of PPACA, the section authorizing state exchanges. Section 36B contains absolutely no language authorizing subsidies through federal exchanges, which are created under section 1321 of PPACA. This lawless IRS rule allows PPACA’s vast new health care subsidies to flow in states that lawfully opted out. Because employer penalty taxes only apply to companies with subsidy-eligible employees, the IRS rule literally imposes taxation without representation to the tune of up to $2,000 per worker. It also commits taxpayers to pay for hundreds of billions in subsidy spending that Congress never authorized, and therefore increases the deficit without congressional authorization. If the health care law as written is so flawed that it can’t be implemented, that’s a reason to repeal it, not to empower IRS bureaucrats to secretly rewrite it. Moreover, the precedent set by allowing the IRS to exceed its statutory authority and effectively impose its own taxes would potentially open the door to unlimited future abuses. consideration, and vote for it on the Senate floor. 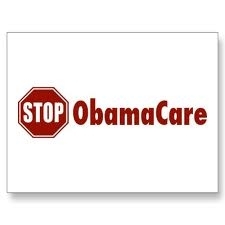 Ali A. Akbar, President, National Bloggers Club, Inc.
TAKE ACTION: If you agree we should repeal ObamaCare, SIGN OUR PETITION NOW. Dean Clancy is FreedomWorks' Legislative Counsel and Vice President, Health Care Policy. He leads our efforts to reverse the government takeover of health care and replace it with a patient-centered system.